I am currently taking limited orders for tack...if you don't mind waiting a bit. : ) The approximate time needed to finish a traditional scale costume is about 6 to 7 months from the time that I recieve the first downpayment. Rider dolls are also now available from MarstonArt!! 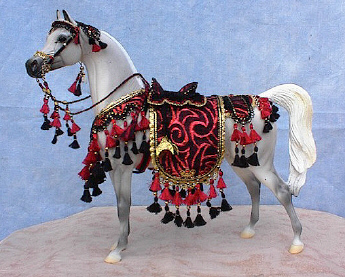 Traditional scale riders will be around $100-$175, depending on what particular style he/she is, and what accessories the outfit might need. Please note that these are only "ballpark" figures, actual prices vary based on design and materials of individual costumes. I realize that these prices may seem a bit on the high side...but each traditional costume takes me at least 60 hours of labor...so after subtracting some money for materials, I end up making less than $5 an hour! I also have a "Complete Satisfaction Guarantee" ... so if anyone is ever not happy with their item, for any reason...I will either replace or refund it. I usually ask for one half of the total payment as a downpayment when a new order is placed. This allows me to purchase any necessary materials, as well as letting me know that the order is "real." The balance may be payed either over time as I work on the costume, or in one payment when the costume is completed. I *usually* do not accept trades, although there are occasional exceptions. As of April 2, 2003. Shipping for halters is $3.00 via regular mail, or $5.00 via Priority. I prefer PayPal as method of payment, but I do also accept Money Orders, and personal checks. Horses not included with tack. Click here for ebay auction.